Get Fit Notepad: This notepad helps you break down your meal plan and goals for the day along with helping you keep track of how much you have hydrated during the day! I struggle with being able to plan my meals and goals out since I'm always so busy, but this is the perfect way to do that! Glitter Sandals: I have had my eye on these glitter sandals from Target for quite sometime. 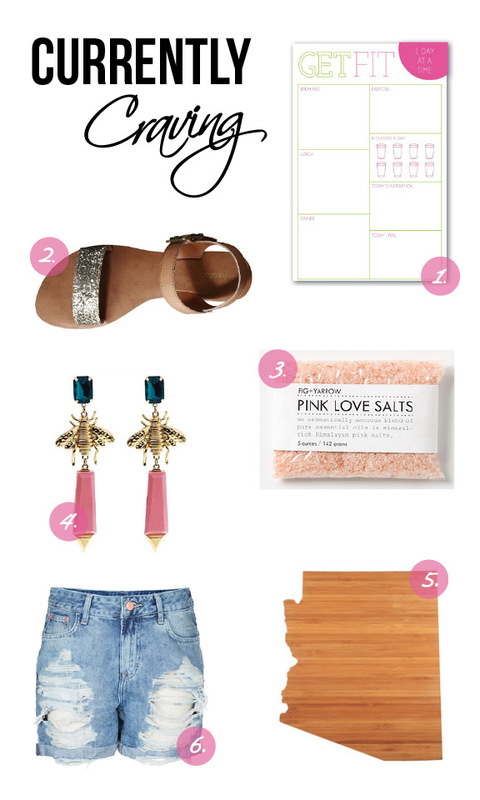 They are the perfect summer style and that little bit of glitter is just what you need for the summer! Pink Love Bath Salts: Nothing like a soothing bath to relax after a long week. These bath salts from Anthropologie help ease tense muscles and allow you to relax and unwind. Odarka Statement Earrings: I am absolutely obsessed with the girls over at VKcollection. Everything on their site is so different and so affordable I want to scoop all of it up! I've had my eyes on these earrings for quite sometime, and I'm not even an earring person! The color combo mixed with the insect is just so different and unique! Arizona Shaped Cutting Board: Now that I am spending more time cooking in my kitchen, I am trying to find statement pieces that will stand out. I was born and raised in Arizona and still live here today so what better way to show some pride then with this cutting board! Boyfriend Style Shorts: To say I am obsessed with this style of shorts is a severe understatement. I have searched high and low for the perfect pair of distressed, loose fitting boyfriend shorts! These ones from Topshop are just what I am looking for! I think I want/need that get fit notepad and the boyfriend style shorts! Just stumbled across your blog and it's really cool!